We received a beautiful deviled egg tray for our wedding and I use it all the time for deviled eggs, but I've been searching for other ways to feature the lovely dish. After tireless sleuthing, I've finally unearthed an appetizer that is worthy of the tray it's served on! They taste great hot or room temperature and yes, should there be any cold leftovers, they are also very good. 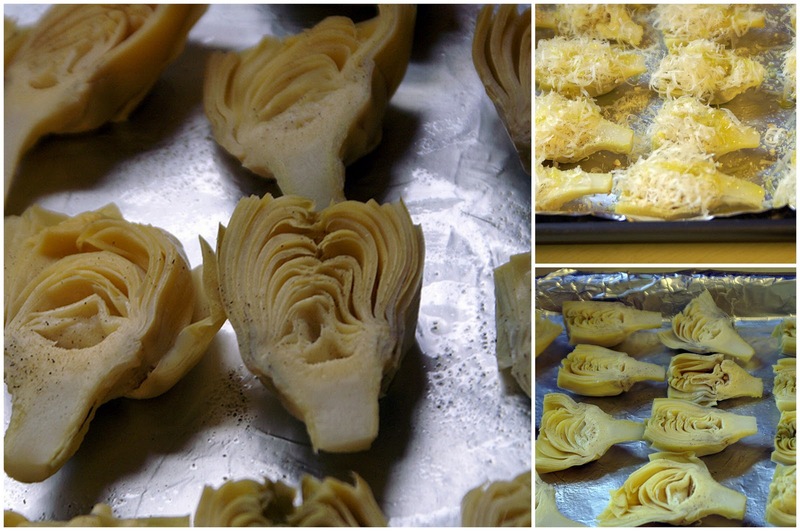 The artichokes themselves are not extraordinary, other than their beautiful presentation. What really makes them stand out is the balsamic mayonnaise dip. Artichokes and balsamic mayo go together like peanut butter & jelly, like butter & toast, like Johnny & June, like... dot and com! They were just made for each other. So whip your deviled egg tray out of storage and prepare these tasty little appetizers: ridiculously simple but très chez gourmet. Mix mayonnaise with balsamic vinegar until you can taste the vinegar -- a few Tbsp. If it's too runny, refrigerate it for around 30 minutes, or add a little more mayo (best when made ahead). Slice the artichokes in half, lengthwise. Turn upside down onto paper towels to drain (important). On a foil-lined lightly oiled cookie sheet, arrange the drained artichokes, salt & pepper to taste, add 1/4 - 1/2 teaspoon of breadcrumbs (to absorb any remaining moisture), spoon on a Tbsp. or so of Parmesan, and drizzle lightly with olive oil. Place 6" under a broiler, and broil about 7 minutes, or until the cheese is golden brown. The children broke my blender, so I use the food processor. It's got that little dribble hole in the top, but you have to make a pretty good quantity in there. I've also used a hand blender with superior results. Olive oil comes in different flavors, believe it or not. The greener it is, the more strong tasting it is and the better it is in dishes where you really want that olive oil flavor to shine through. I use the golden olive oil when I don't want to taste it, and that'll work fine for mayo. Or you could try safflower or sunflower oil. My experience with safflower oil is that it is very mild tasting, but it goes bad fast, so I don't prefer it. I've never tried sunflower or peanut oil.